Product categories of Composite Insulator, we are specialized manufacturers from China, Composite Insulator, Silicone Composite Insulators suppliers/factory, wholesale high-quality products of Composite Polymer Insulator R & D and manufacturing, we have the perfect after-sales service and technical support. Look forward to your cooperation! The composite insulators produced by the company are made of special steel products. The fittings use labyrinth design principles, multi-layer protection, and good sealing performance, which solves the most critical problem of insulators-interface electrical breakdown. The connection between the metal fittings and the mandrel adopts the most advanced computer-controlled coaxial constant pressure crimping technology in the world, and is equipped with a fully automatic acoustic emission testing system to ensure the reliability and stability of the connection between the metal fittings and the mandrel. The core rod adopts ERC high-temperature acid rods, and the core rod and silica gel interface are coated with special coupling agents. The umbrella cover adopts a one-time integral molding process under high temperature and high pressure and cooperates with the computerized two-stage curing process.Extended product life. 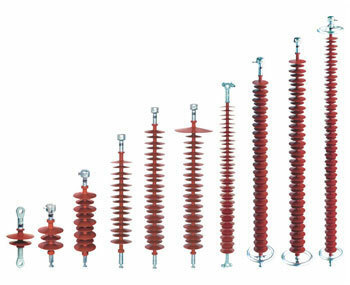 Advanced production equipment and manufacturing processes, complete testing equipment and testing methods ensure that all technical indicators of the product meet relevant domestic and international standards and become a new generation of high-voltage insulators.